US-based Ergobaby are dedicated to building a global community of confident parents with smart, ergonomic solutions that enable and encourage bonding between parents and babies. 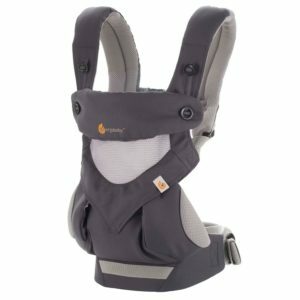 Beginning with a parent's love for her child and her desire to keep him close, the ergonomic, comfortable design of the Ergobaby Baby Carrier was born. With Big Apple Buddy’s personal shopping service, you can now buy direct from the Ergobaby online store anytime, anywhere. 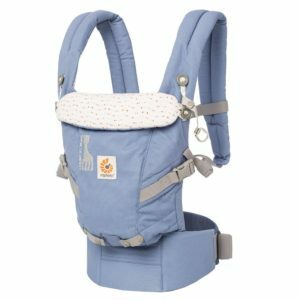 The Ergobaby ADAPT Baby Carrier - Sophie La Girafe - Festival is a Limited Edition Adapt 3 Position Carrier, in a beautiful periwinkle canvas with a charming flag bunting lining. 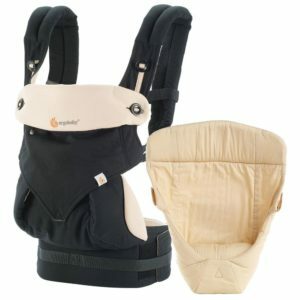 The perfect gift for new parents: the award-winning Ergobaby 4 Position 360 Baby Carrier in Black & Camel with its innovative ergonomic forward-facing position to discover the world, and the matching Easy Snug Infant Insert for a cozy transition to the world from the womb for newborns. Unfortunately, the USA Ergobaby online store does not currently offer international shipping. However, Big Apple Buddy, your personal shopper, can help you buy products direct from the official USA Ergobaby online store and ship them to your doorstep, no matter where you are in the world. If you would like to buy from the USA Ergobaby online store, simply let us know which items you would like to order (by filling out the form below) and we’ll get back to you with a free international shipping quote within 24 hours!